For the challenge at Sunday Postcard Art. This weeks theme is "EYES"
Wow a spectacular Postcard Julia - beautiful in every detail! WOW, this is amazing. 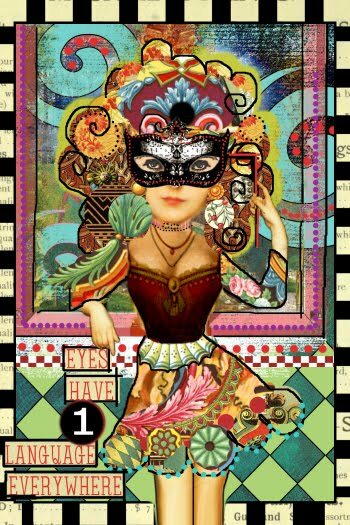 I love this card, the beautiful colors, and the eyes behind the mask, great piece! OMG - Julia, you`re such a talented artist!!! This piece is gorgeous. Definately a favorite of mine!!!! Oh wow Julia this is very impressive. Lovely quote and gorgeous colours. Geweldig!! prachtige kleuren gebruikt. Vrolijk geheel geworden! Wow! This is amazing. I REALLY, REALLY love this! Wow hier val ik stil van.....wat prachtig! Beautiful! So colorful and bright! Julia, this is absoloutely stunning! Your colours and composition are spot on - fantastic! So very pretty. 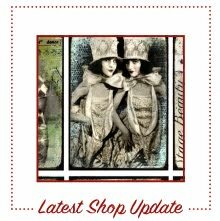 I love all the embellishments and colorful images that you used. Oh my, this is really fabulous. Beautiful work. o my goodness! your work & blog are wonderful! going to take a look around & pop in to your store!! It's me, your #1 fan.....just to let you know you've excelled again! Excellent!! Love this, Julia, absolutely amazing. Cheers! Absolutely stunning, Julia, love the quirkiness! OH MY, WOW, this is totally fantastic!! You've hit all my art spots with this one!! Gorgeous, creative, colourful, I love everything about this piece!! BRAVO!! How true. Thank you and have a great weekend.